We had a tornado warning last night. I live in New England and it’s November. I thought it was a mistake. The National Weather Service meant to simply issue a High Wind Advisory and pushed the wrong button. I could hear the wind passing through the tall stand of trees next to my condo. Then, I received an email notice of the High Wind Advisory AND another Tornado advisory. I was in my pajamas after a hard day constructing Venus from marshmallows (He liked the idea!!) and I looked around and said, “O, c’mon! I’m too tired for a tornado!” and turned on the TV to check local stations. That was five hours from now. What was I supposed to do? Go down to the basement? To a room without windows? Gather my sentimental and important documents into a bag that I could carry? The wind really was beginning to take on “freight train” decibel levels. I went to sleep and woke up early in the morning after the storm had passed though the winds are still high and moaning. Yes, that is the right word. 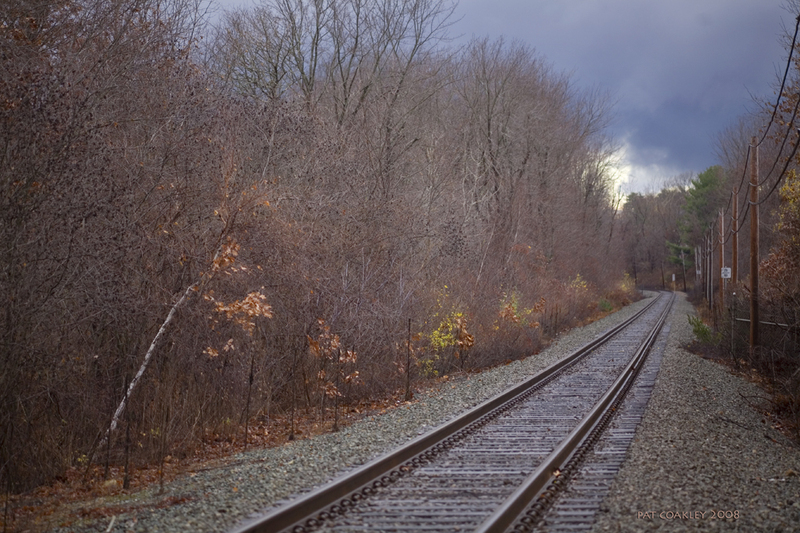 I went out early with my coffee and took this photograph along side the train tracks that go into Boston. There were no reports of a tornado touching down in New England last night but if there had been, I would have died in my sleep which, truth be told, Is a little what November and this photograph feels like to me. Shiver me timbers, it’s that time of year, Pat. Pleased to know you’re okay. Perhaps you should chat with Bonnie about the scariness of weather. As for the photo, perhaps it’s because I love Robert Frost and so many of your recent pix remind me of his poems, but this one, even though we can’t see what’s coming up ahead, is reminiscent of Road Not Taken. I love that poem and this photo matches it perfectly. The picture reminds me a movie still. Can you sense the train shooting around a corner any moment from now?? You wonder how screwy the weather patterns have gotten that you could have a tornado warning in MA in November. It seems it’s not just polar bears that have worries over the shifts. It’s quite terrifying to be beholden to elements you can’t control. And the freight train analogy is so accurate. Phew….I’m glad you didn’t get whisked into Dorothy land in your pajamas. Sorry, I think I sent our wind to you, wait, no, you sent it back dang! Glad you survived. This is another lovely photograph. Wonderful composition!My mate is a volunteer on a scenic railroad.